Which ensemble received the preceding accolades? The success of Bill Ryan's Grand Valley State University's New Music Ensemble (GVNME) is truly amazing. A medium-sized and largely unknown music department in West Michigan has a New Music Ensemble that suddenly lands on the national scene as a serious artistic force, garnering multiple reviews in the New York Times and a slew of the nation's most prominent newspapers and magazines, releases three CDs on major new music labels, and performs at Carnegie Hall, Bang On A Can, and Le Poisson Rouge? In addition to the obvious artistic and pedagogical successes involved, this is also a college recruiter/development officer/music department chair's dream come true, something that no other university ensemble I know of has ever achieved. It's strange, wonderful, unlikely, and improbable, like some kind of "New Music Mighty Ducks." That's probably why I am constantly asked about GVNME's success (usually with a quizzical look of bemused disbelief). 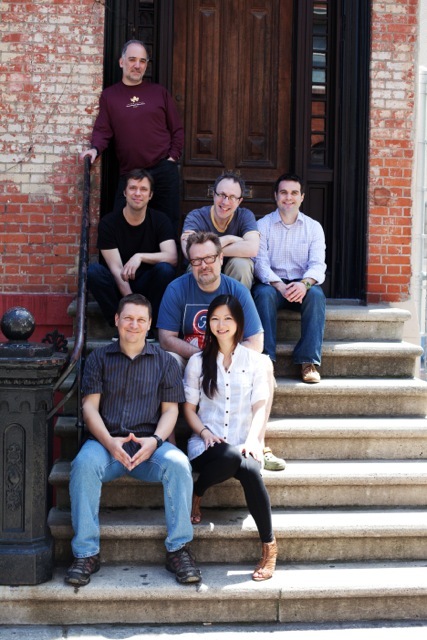 So I decided to talk to the group's director, Bill Ryan, about the ensemble, his pedagogical approach, his views on the music business, and of course, his outstanding new recording by his group BillBand (another stellar incarnation) entitled: Towards Daybreak. KE: Your reputation as a contemporary music advocate has continued to grow over the years, with several awards and recognitions including the Michigan Governor's Award in Arts Education in 2008, the American Composers Forum's Champion of New Music Award in 2009, and several ASCAP Adventurous Programming Awards. I still think that the crowning achievement is the work that you have done with the GVNME. You did something that every university in the country would love to claim as its own--you molded a group of mostly undergraduate students into a world class ensemble, and then recorded two of the masterworks of minimalism (Terry Riley's "In C" and Steve Reich's "Music for 18 Musicians") with that same group to the overwhelming acclaim of the national press. Grand Valley State, however, is a far cry from Juilliard. What made you think you could succeed in programming these pieces? BR: All I was trying to do was expose our students to some important literature--which should be happening in all degree areas, irrespective of ability. I wasn't sure what the end result would be in terms of performance quality, but I knew that the experience of putting the music together, no matter what the result, would be invaluable as far as understanding and appreciating those composers. When we tackled Music for 18 Musicians, I hoped that we could eventually run the piece without stopping, and perhaps show it in an open rehearsal by the end of the semester. The group far exceeded that. KE: How did you make this happen? What were the greatest challenges and greatest rewards? BR: I'm a bit of a baseball junkie. In sports, a frequent characteristic of championship teams, no matter their ability, is good team chemistry. This absolutely applies to music ensembles. Having musicians that work well together, support one another, and put the group before themselves will result in performances that often exceed the individual talent of the players. I can control this (a little) by who I ask to be in the ensemble, but mostly I try to create this by being positive, insisting on personal responsibility, and mutual respect. For example, when rehearsing something, rather than me just spouting off about this or that, I'll frequently ask for student feedback. And rather than just nod my head, we'll try to implement their ideas. I also involve them in the behind the scenes details like choosing the music we perform, the composers we commission, concert staging, and venue choices. The result is that they are much more connected and invested in the success of a project than they would be if they were just there to play notes. KE: Would this have been possible in a remote Great Lakes location 25 years ago before the internet and the personal computer really took hold? BR: I don't think so. What would have happened 25 years ago is we would have had a nice concert on campus, and then repeated that, as all college ensembles do, every semester, year after year. Most likely no one outside of west Michigan would know what we were up to. As it is, our timing worked out perfectly--I founded the group in 2006, made a small website, and for whatever reason our work was noticed by a few people outside of our community and it spread from there. It's all pretty amazing to me. We even have over a million views of our YouTube videos. Crazy. KE: Tell us about your pedagogical approach, and your efforts to market and create these unique and much heralded recordings? BR: I've always tried to bring real world experiences into my classroom. I want my students to understand the relevancy of what we're doing. There is no clearly defined career path for a musician to follow anymore, so I think the more experience they have with actual possibilities, while in school, the better equipped they'll be upon graduation. Recordings are one way that I've tried to do this. Most music students graduate without going through the process of making a professional CD. The process has unique demands that are very different from performing in a concert situation. In addition to the actual recording part, there's a tremendous amount of work that goes into editing and mixing, design and marketing. The three CDs we've made gave the students insight into the business, something to put on their resumes when they look to graduate school or employment, and a bit of a recorded legacy that hopefully they continue to add onto. KE: What's next for GVNME? How do you follow up such incredible successes? BR: We released CDs in 2007, 2009, and 2010. Frankly, I got a little burned out by that pace, but we'll definitely be recording again. A lot of my recent focus has been on taking the group off campus to perform--to Detroit, Chicago, New York, Washington D.C., Philadelphia, Baltimore. I'd like to continue to travel, but head west. 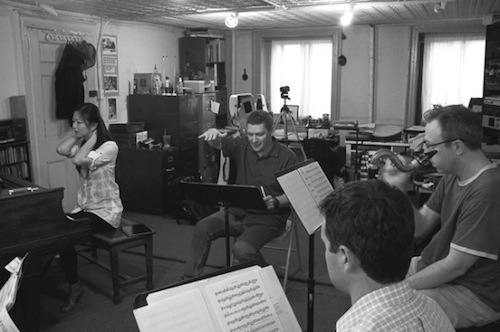 We also continue to commission composers, and will be premiering a few new works in upcoming seasons. I've got some other fun ideas too, I'm just not quite ready to announce. KE: It is quite rare that a university ensemble makes recordings that make the "Best of" lists of major newspapers like the New York Times or have their music used in major television productions (portion of the Reich recording was used in MTV's remake series of "Teenwolf"). Does this translate into good sales figures? BR: What is perceived as good sales for the classical music world is very different than good sales in the pop and rock world. For our three CDs we're still in the red, although I expect to break even in a few more years. This to me is a remarkable accomplishment--that a university contemporary music ensemble will eventually break even on three CDs that were very expensive to make. However, this should also be a reality check for people. We had tremendous national coverage, were critically lauded, even made the Billboard charts, and yet five years later are still two years out from being profitable. KE: Where do you see recordings in the overall business picture of music in the 21C? BR: Recordings remain as important as ever for musicians. People expect you to have one (or more). Without a CD there are no bookings, no tours, no radio play, no press coverage. For a composer, a professional CD greatly increases chances of future performances and commissions. Unfortunately, the income to be made off of them is becoming less and less. Not only are people buying less, but the streaming services, which I think will be how everyone accesses music in the near future, pay the artist next to nothing. I'm not sure how those fees were negotiated, and who agreed to them, but after you factor in production costs, 99% of all musicians will never make a dime off of their recordings. KE: We've read so much about the problems with the humanities and the arts in higher education, mostly having to do with the age-old dissonance between job training and a liberal arts degree. We've also seen many symphonies around the country running into serious financial difficulties, with cuts in pay and cuts in performances, all of which are lowering opportunities for musicians. Music schools, for the most part, are training people to become either music teachers or performers. Given all of this, what do you think the music landscape in higher education will look like in 2030, when you'll be retiring? BR: I would like to think that we will always need incredible performers and teachers. I don't think anyone can deny though, that traditional outlets for performing careers, like orchestras, are shrinking. The musicians that will thrive in this new environment will not only be skilled performers, but versatile in the music they can perform. They'll be able to improvise. They'll be creative thinkers. They will be as comfortable in outreach settings as they are on professional stages. There are already a few schools presenting solutions--the Entrepreneurship Center for Music at UC Boulder and the Entrepreneurial Musicianship department at New England Conservatory come to mind. My guess is that all programs will eventually adopt something similar. KE: After many years developing student ensembles and building programs, you just released a fabulous new CD on Innova, "Towards Daybreak", which follows some nine years after your first recording. The recording is really outstanding; from your exquisite writing, to the production and the top notch performances, this is a wonderful new recording from the inimitable BillBand. While many composers in this genre rely on the seductive rhythmic or modal qualities imported from pop music and minimalism for their allure, your music, while using those same devices, instead relies on a mastery of form and proportion. It's been a long time since your first recording. Does this signify a return to your focus as a composer after so many great successes as a teacher and ensemble director? BR: After that first CD I was pretty consumed with life in general, and then for sure the work with the GVSU group. Not that I haven't been composing, but my output has only been about a piece each year. To be a successful, prolific composer, you have to be pretty selfish with your time. I've dealt with people making their living as composers, and they set aside a very small amount of time in their day for emails, for phone correspondence, for all non-compositional activity. That's how they are able to produce what they need to. I simply haven't had the interest in that sort of life. I love being a professor, and when you're doing it right, that means giving your time to your students. But yes, now that the GVSU ensemble doesn't have a recording in the works, I'm diving back into my own music for a bit. KE: Tell us about the recording. BR: I produced the album with Silas Brown, who also recorded and mixed it. I've worked with Silas on all three of the GVSU CDs, and he is simply amazing at what he does. The musicians are all people I've worked with for years--mostly through the schools I've worked at--supporting them individually as performers and composers. All the tunes on the CD, except one, were composed since 2005, with half of the music coming out of terrific collaboration last year with the Karen Stokes Dance Company. KE: What are you most happy with or proud of in this recording? BR: I'm most pleased with the sound quality. I poured myself into this music, and to have it fall a little short in terms of the sound would have been unsettling. Each finished track is exactly what I envisioned when I was writing. I'm really thrilled with the results. The recording really captures my music as to how I initially envisioned it. That's a testament to everyone on the production side of things, as well as the musicians. Bill Ryan and BillBand will be celebrating the release of Towards Daybreak with a performance in New York City at Le Poisson Rouge on Sunday, February 10, 2013, 7:30PM. *Photos by Tim Darwish, used by permission.